This is a fun commission that will really explain the concept behind our “LIMITED ORIGINAL” giclees on canvas. My collector wants two embellished giclees of my painting, The Glory Never Fades. Even though the reproductions start out the same the giclees are going to end up looking quite different. 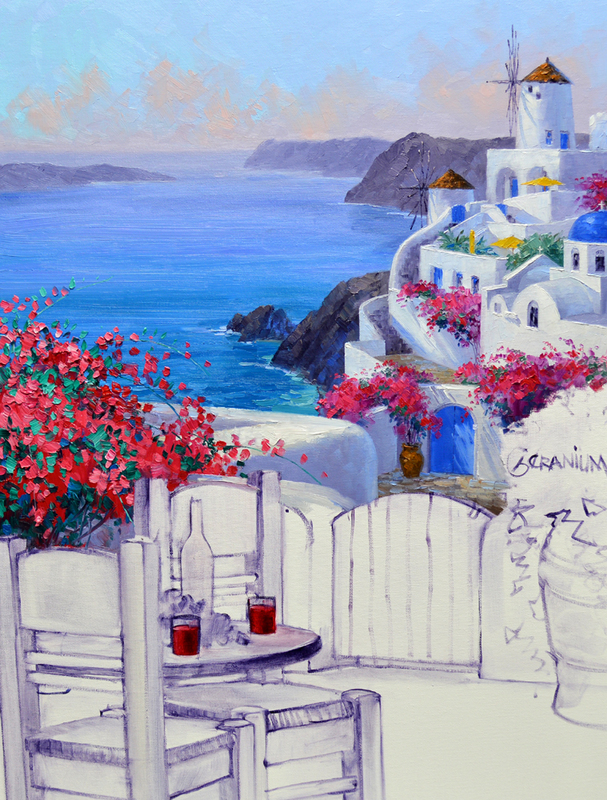 We decided to add more foreground on the first piece, a gift for their friends. I’ve taped off the extra area, this will make the finished giclee 24 inches by 30 inches. VIDEO! 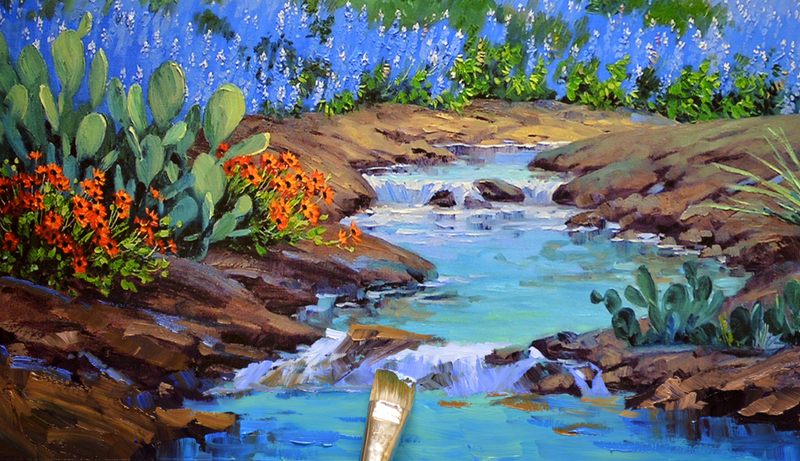 First I cover the white area of the canvas by washing in the rocks and water. 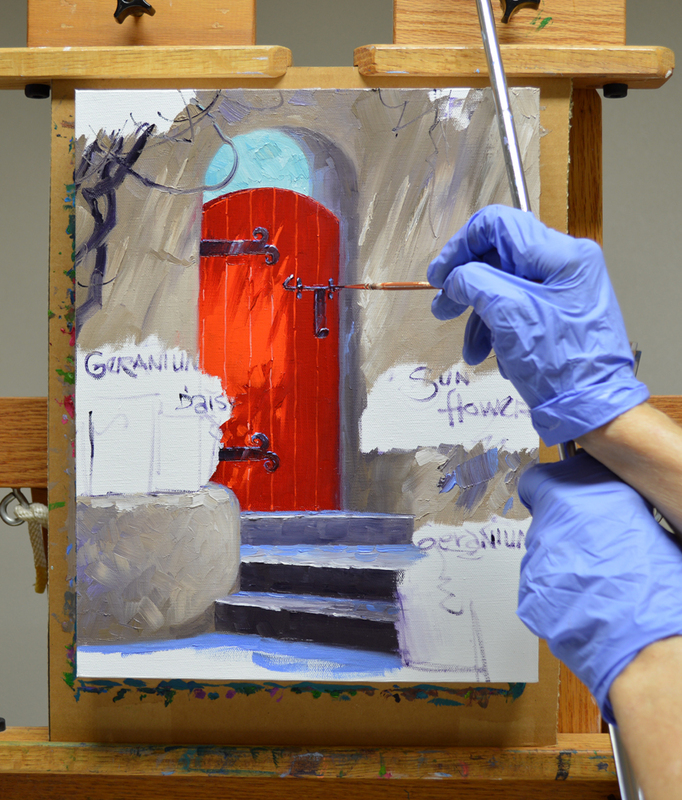 I work with Winsor Newton GRIFFIN Alkyd Oil Paints which dry faster than regular oils. I prefer to use Alkyds rather than Acrylics. 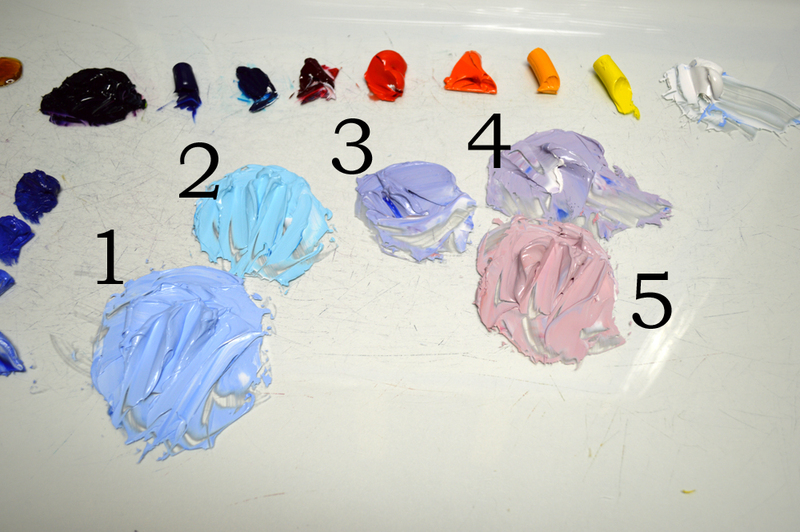 The colors are the same as regular Oils and don’t darken as they dry like Acrylics. When the underpainted area of the expanded foreground is dry I come back in to add the details in the rocks and water. Thought it would be fun to make another little waterfall in the front. Our collector’s friends are University of Texas Longhorn fans. So we’ll make the flowers in the left corner “Longhorn Orange”. The neat thing about this is years ago Jack helped Rooster Andrews select the new color, a deep burnt orange, for the UT logo. Previously the school had a brighter orange, but felt it was too much like that of the University of Tennessee. 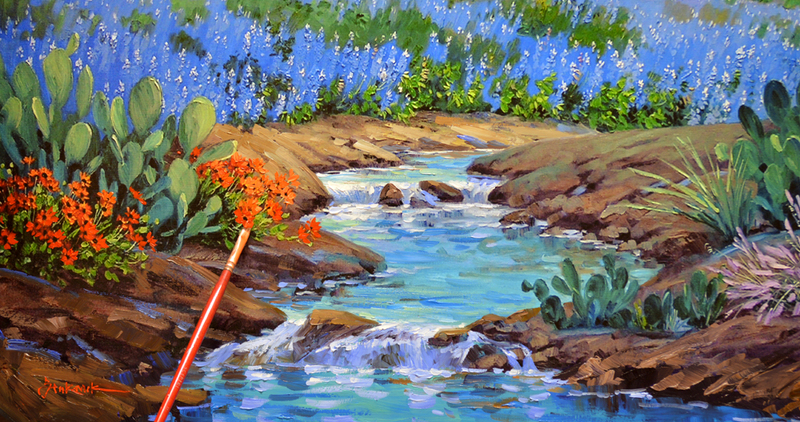 I felt the water fall in the front was too “Straight across”, it paralleled the lower edge of the canvas. So I changed the rocks a bit and added a few more upstream. Can’t you just hear the trickling music of the water as it dances over the rocks? Next the flowers in the right corner are repainted. 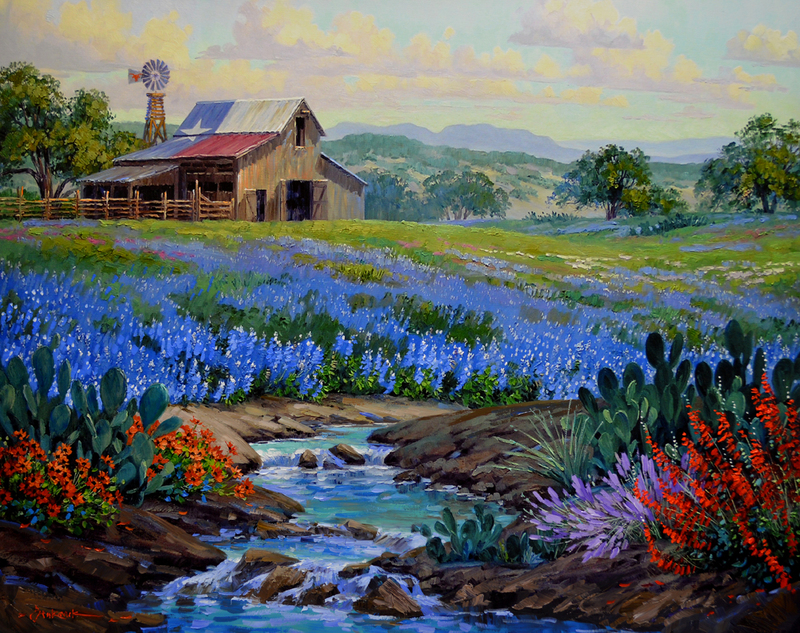 Moving to the other side of the babbling brook I begin embellishing the Bluebonnets. The icing on the cake is to add the little white “Hats” on the tips of the Cobalt Blue flowers. Please remember as you read through my blog, you can click on any of the pictures to see them larger. Judy also requested I put in a windmill near the barn. Bracing my wrist against the mahl stick to steady my hand, I add a tiny Longhorn logo on the vane. The doors, windows and dome of the church in the distance are all Cobalt Blue + White. 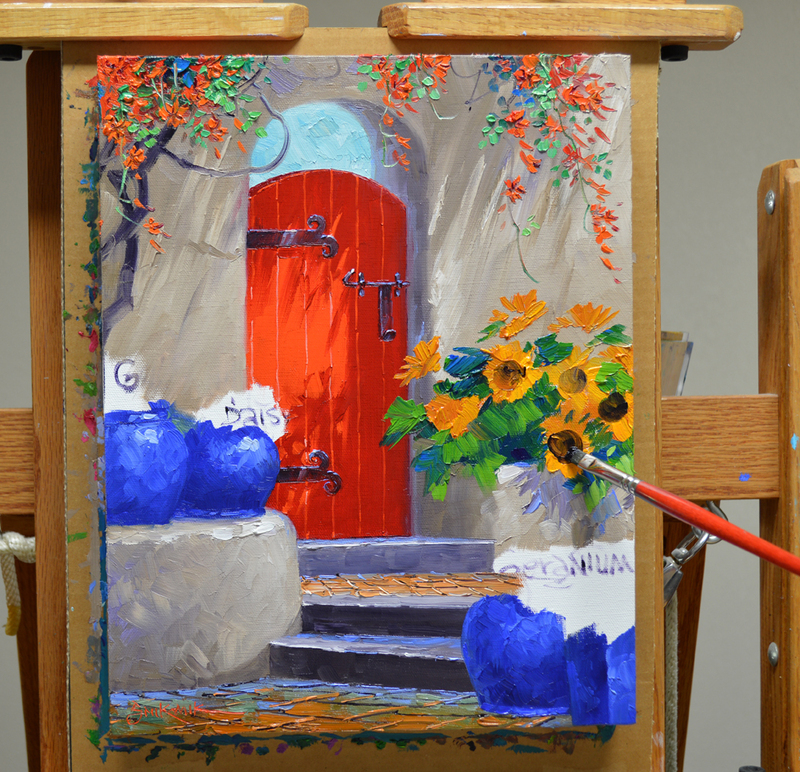 For the gate I add a little Pthalo Blue to the mix. This intensifies the blue, making it jump in front of the ones in the background. 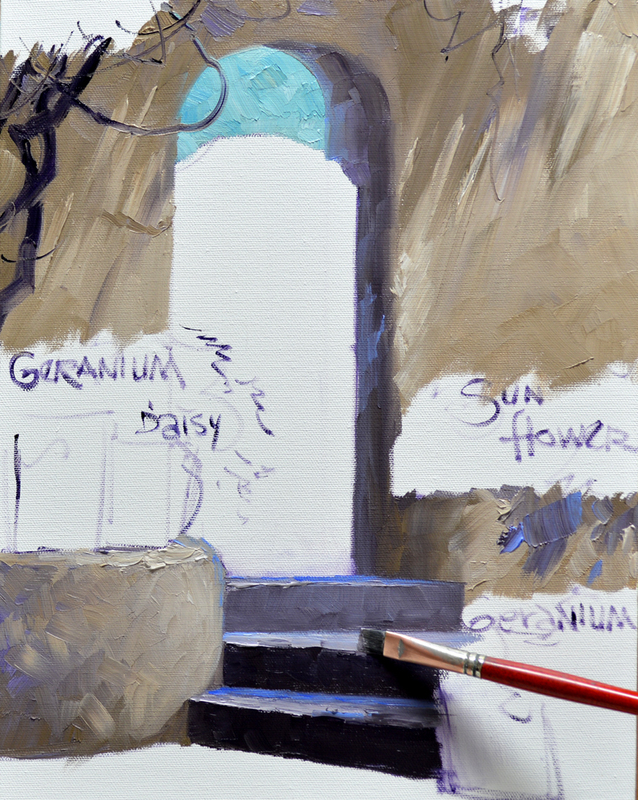 The entire surface of the floor is first covered with mixes of Ultramarine Blue + Cadmium Orange + MUD + White. The edge nearest the gate is made more blue so it drops back. Then I pull the wide, white grout lines into the wet paint. Since the terrace is in shadow I use some of the darker shades from the stucco walls in the distance for the grout between the stones. VIDEO! 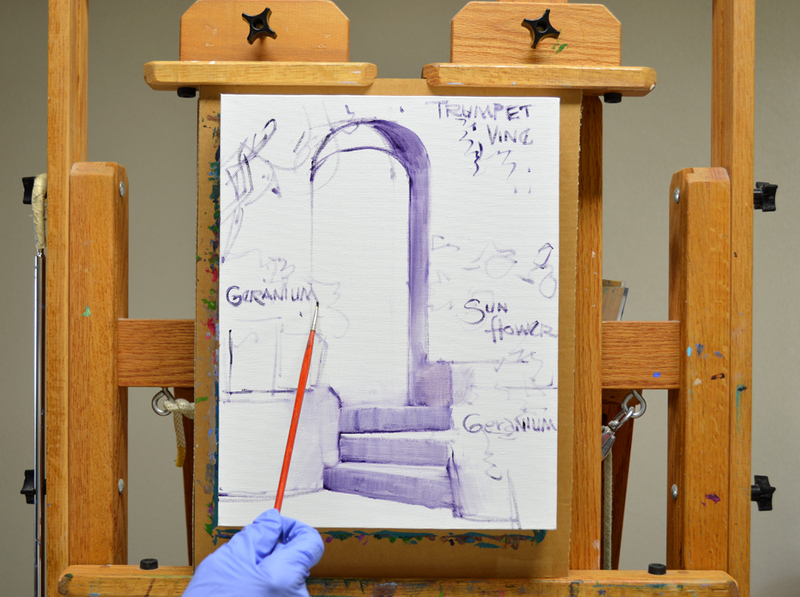 The wine bottle is blocked in with washes of Sap Green + Liquin and Alizarin Crimson + Liquin. Highlights are “Lifted Out” of the washed in color with a clean brush. Several of you have asked me to add narration to my videos. I agree with you, that would make them even more helpful. I’m very blessed as an artist, I have empty spots on my gallery walls to fill and several commissions to paint. So at this point I just don’t have the time to do any voice overs, maybe one day in the future. But I sincerely thank you for your suggestions. After painting the yellow chair behind I begin working on the red bistro table. 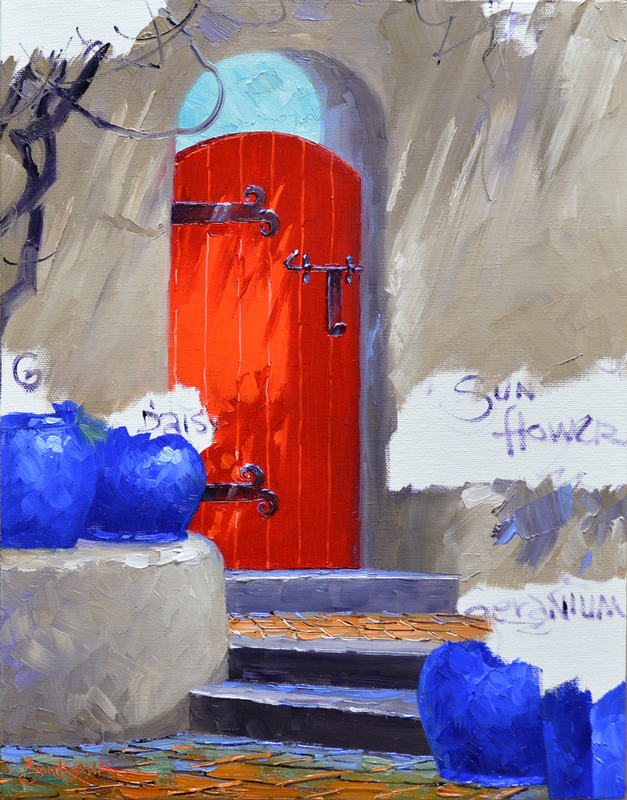 Cadmium Red Medium + White and Cadmium Red Dark are used. 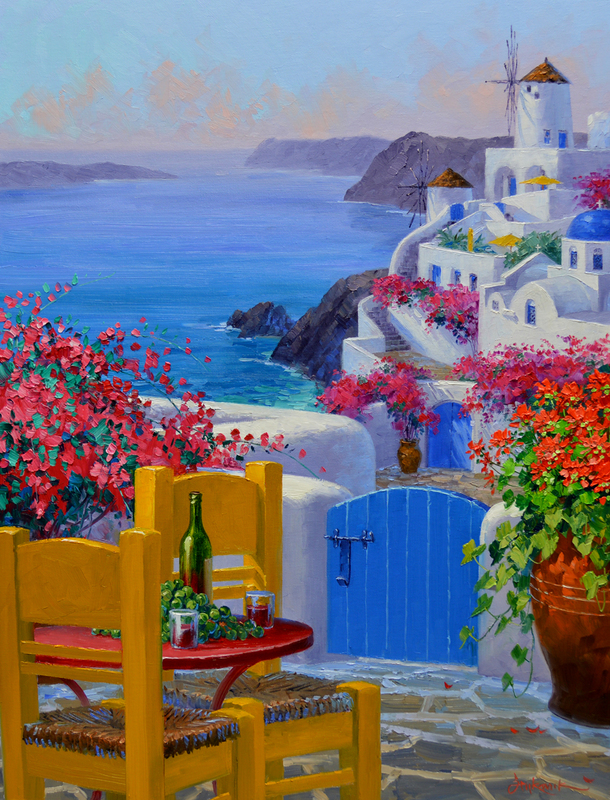 Red, Yellow and Blue, the primary colors of Santorini! 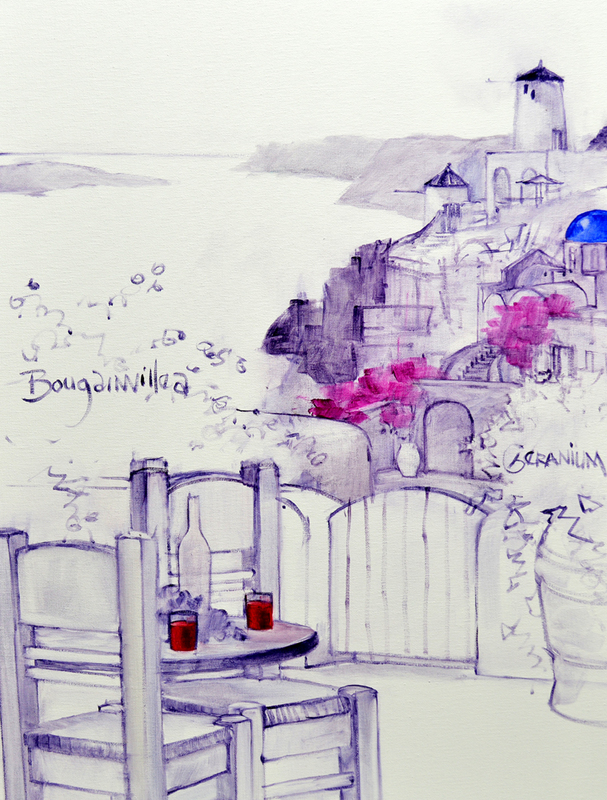 The Bougainvillea in the foreground is blocked in before the water in the background dries. I have to carefully “Lay” the flowers, or bracts, on top of the blue so I don’t pick up any of the underlying color. I do this now because it’s easier to draw the fine lines of the vine arms reaching out while the paint behind them is wet. Mixes of Permanent Rose + White and Permanent Rose + Cadmium Red Light + White are used for the fiery blossoms. One of the things I love about Santorini is the jumbled buildings that seemingly tumble down the cliffs. The highlights on the white stucco actually have a touch of blue mixed in. This cools them so they will fall into the background. Pure White + the tiniest touch of Lemon Yellow is reserved for the sunlit portions of the wall in the foreground. The warm White mixture will make the wall appear to come forward. 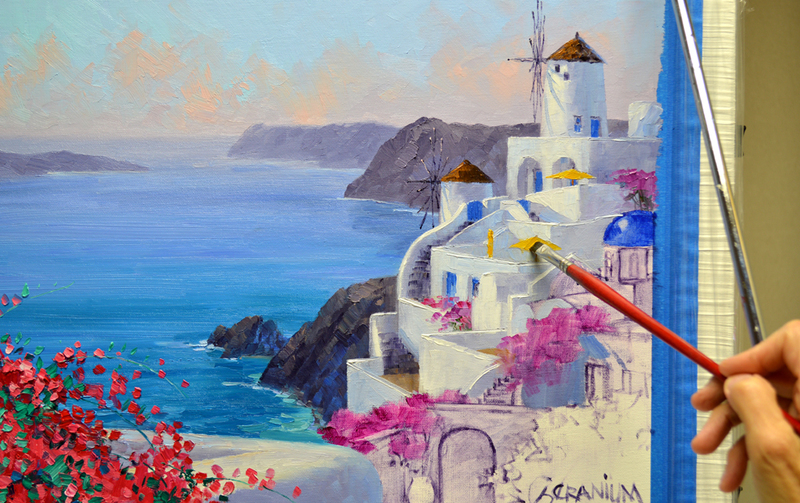 The miles of steps are far easier to paint than they must have been to build 🙂 You can click on this or any of the other images to see them larger. It’s fun adding umbrellas on the terraces! My wrist is braced against a mahl stick to steady my hand as I delineate the details. The domed church is a little closer to the viewer so less blue is mixed into the highlights. I want it to jump in front of the buildings in back of it. I begin painting with the sky. My paint is all mixed and we’re ready to begin. #1. Cobalt Blue + White. #2. Pthalo Blue + White. #3. MUD (Ultramarine Blue + Alizarin Crimson) + Ultramarine Blue + White. #4. MUD + White. #5. Mix # 4 + Alizarin Crimson + White. If you’d like to learn more about our Double Primary Color Mixing System CLICK HERE. VIDEO! 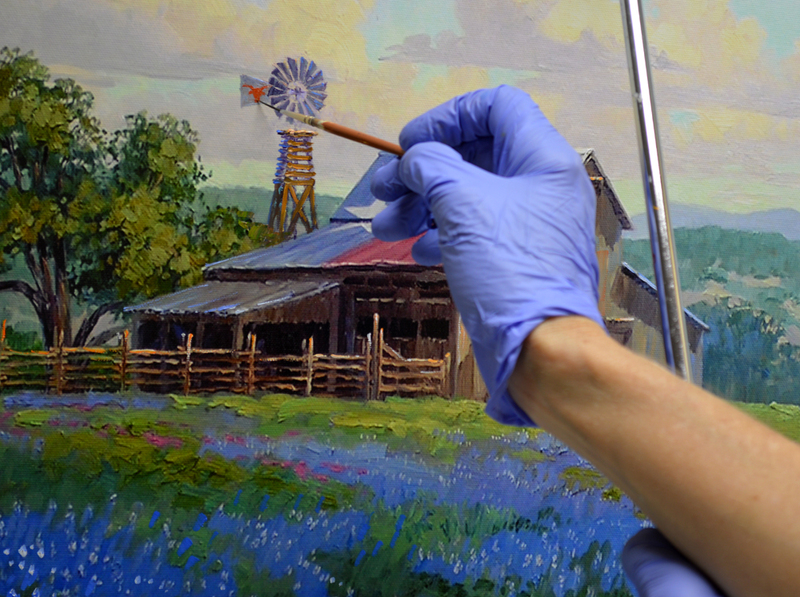 I begin with the blue, using the darker #1 mix toward the top of the canvas. Mix #2 is reserved for the lower part of the sky. The clouds are painted over the blue. Working wet-into-wet keeps the edges of the clouds soft. VIDEO! Highlights are added to the clouds with mixture #5. Then the horizon line of the ocean is dragged over the wet sky. Since the moisture in the atmosphere makes the horizon line fade, I show a simple method how to make it softer. This follows a basic rule to give the appearance of depth in a painting: Soft Edges Recede, Hard Edges Come Forward. In painting the water my mixtures toward the horizon are made of Ultramarine Blue + MUD + White. The middle, transitional area is Ultramarine Blue + White. 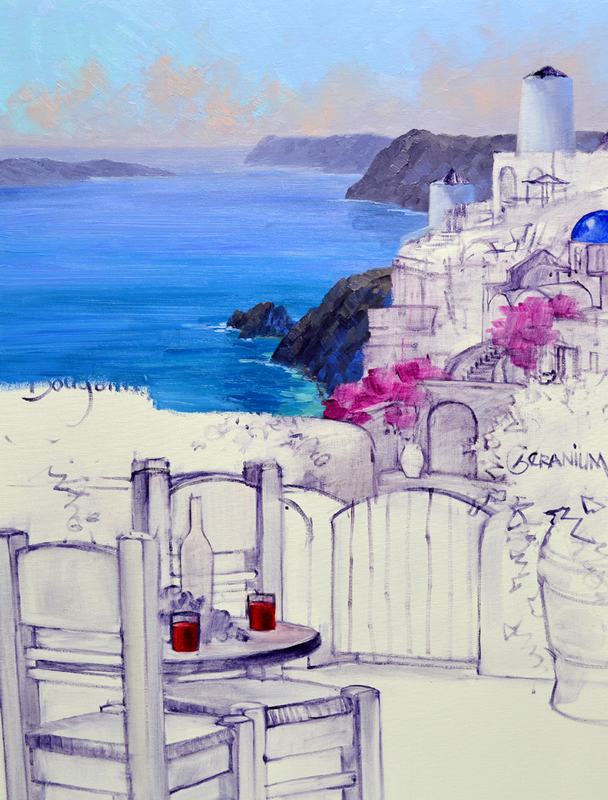 Moving closer to the foreground I use combinations of Pthalo Blue + a touch of Cadmium Orange + White. 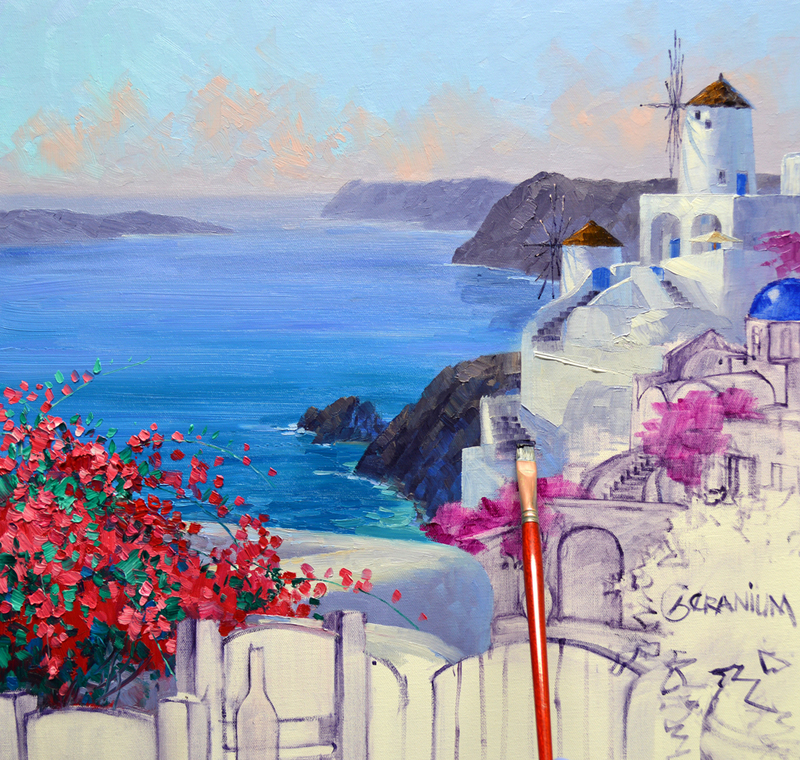 This commission takes us on a magical trip to one of Jack’s and my favorite places…….Santorini, Greece. 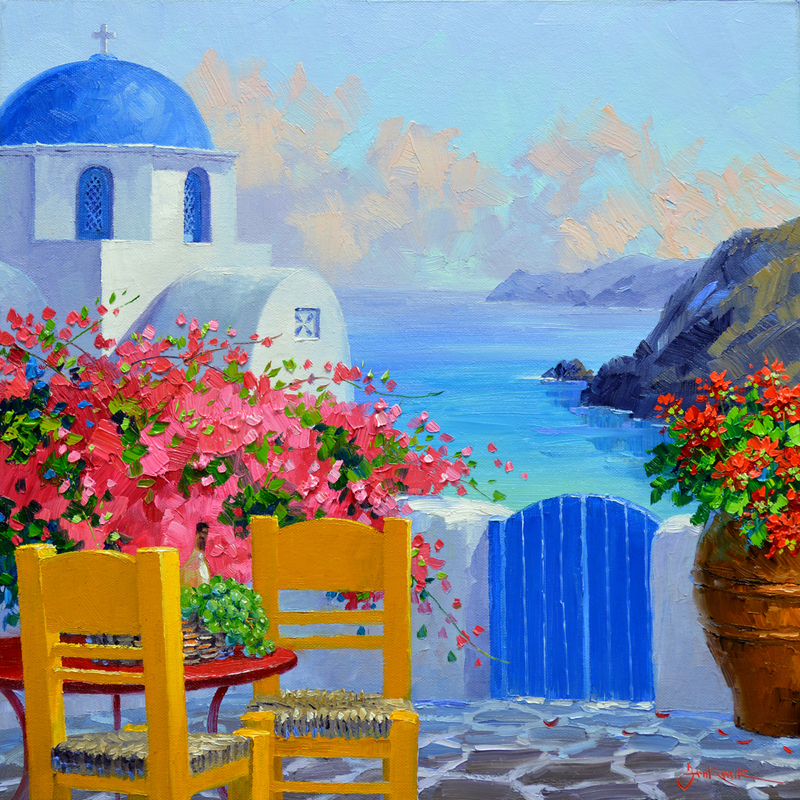 My collector fell in love with Serene Santorini, it’s shown above. However, this piece sold quite some time ago so I suggested that I paint a similar piece especially for her. After we visited for awhile she came to the conclusion that a vertical piece would work better for her space. 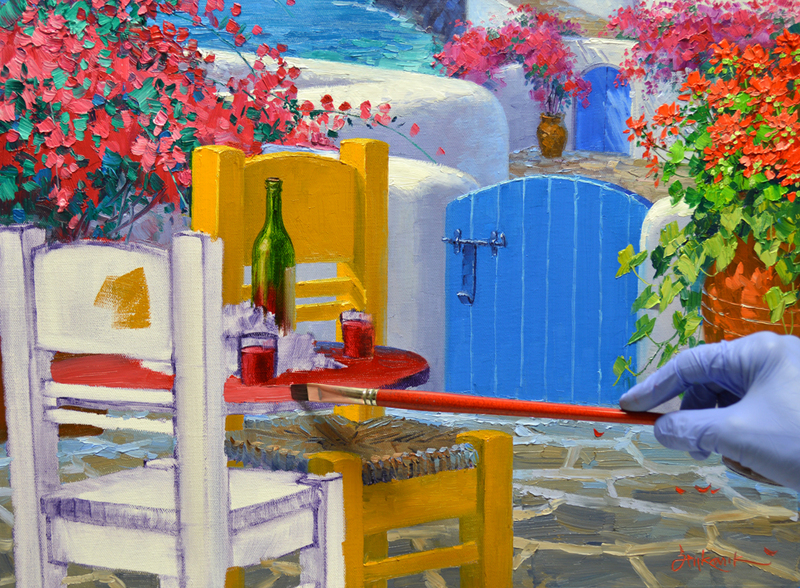 My collector wanted to show more of the beautiful Aegean Sea and also requested a couple of glasses of red wine on the table. Here is my pen and ink sketch. The painting, framed in my Signature Frame, measures 30 inches tall by 24 inches wide. 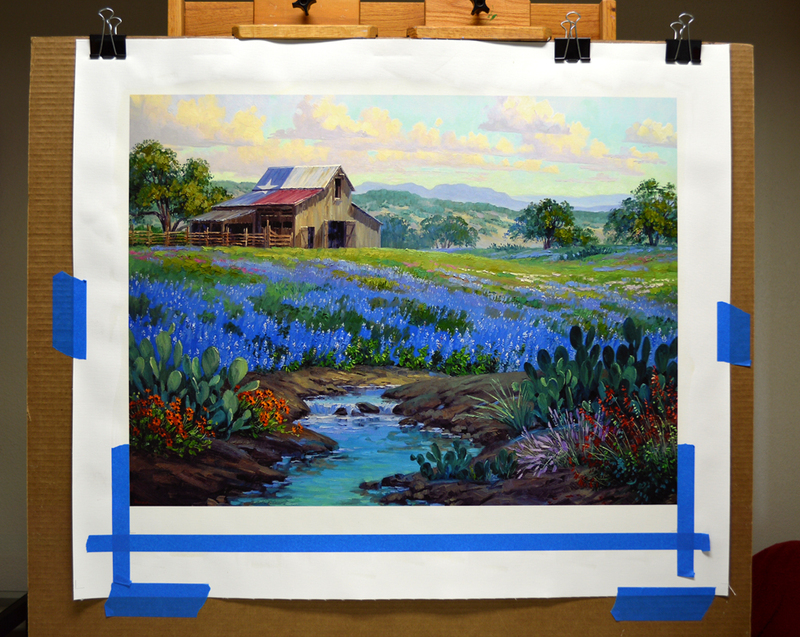 The frame is protected by shrink wrap and blue painter’s tape to keep it clean as I paint. 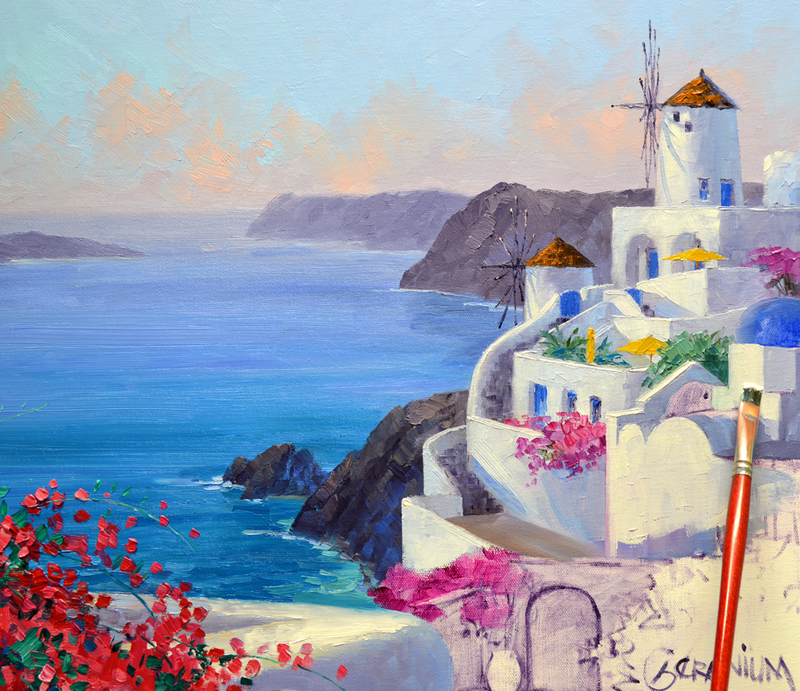 Since we are high on the bluffs overlooking the Aegean Sea, the horizon line is placed about a quarter of the way down from the top of the canvas. 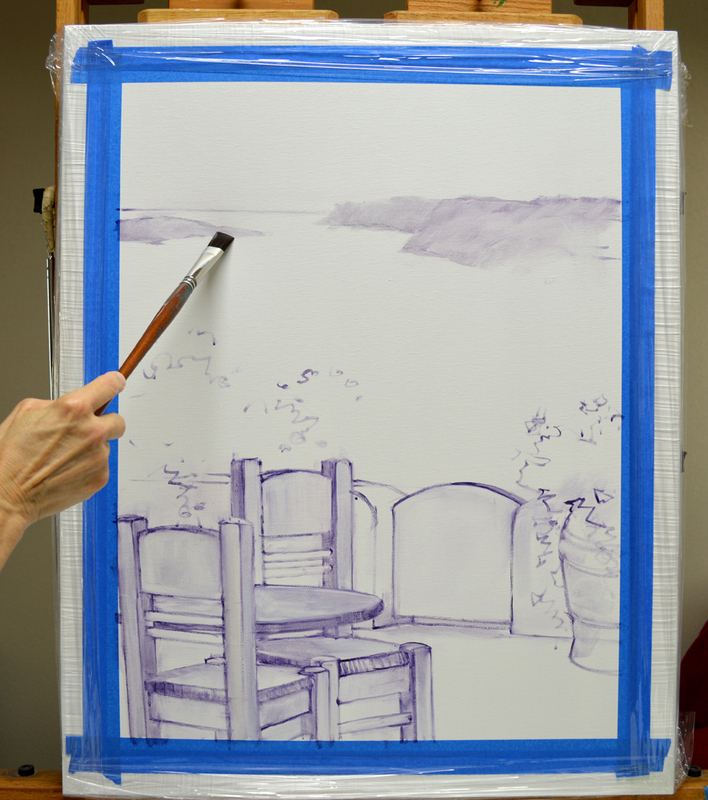 After establishing the horizon line the table and chairs are drawn. Now the distant islands and bluffs are lightly blocked in with an oil wash of MUD (Ultramarine Blue + Alizarin Crimson) + Liquin. 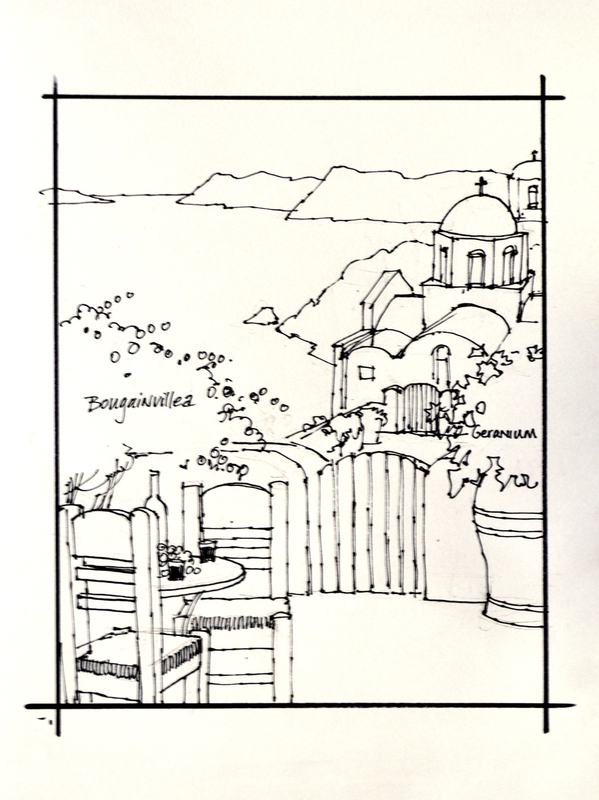 When my collector saw the pen and ink sketch she asked if I could make the domed church smaller and include more of the characteristic, white buildings “tumbling” down the bluffs. I suggested adding some of the windmills that are prevalent on the island. You can click on this or any of the other pictures to see them larger. 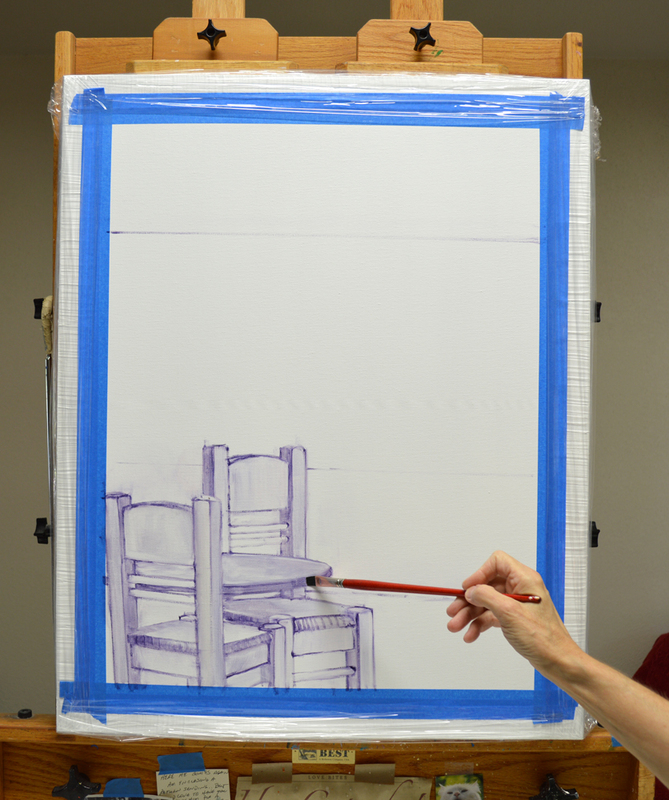 The basic plan is sketched up on the canvas, we’ll begin painting in the next session. I’M BACK! My Annual Collector Event in Santa Fe was a lot of fun. Was great to see all of the Team Senkarik Members who attended, many have become dear friends over the years. Honestly, it felt like old home week. Made several sales and came back with commissions to paint. I feel so fortunate as an artist, I have far more to do than I have time for. God has truly blessed Jack and me. I want to extend a big Texas MUCH OBLIGED to everyone that came, as well as the wonderful owners and staff at the Santa Fe Art Collector Gallery who worked so hard to make this event a success. Now it’s time to get back to the easel. My eBay collectors were very patient as I worked on paintings for the Big Event. So this first piece is for y’all! 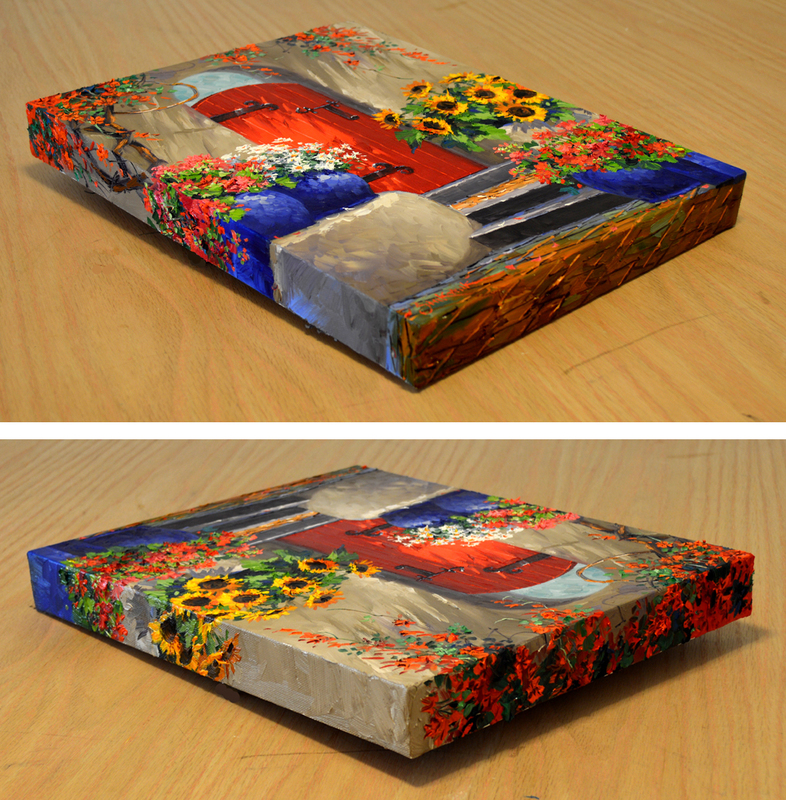 The gallery wrap canvas is 14 inches tall by 11 inches wide. 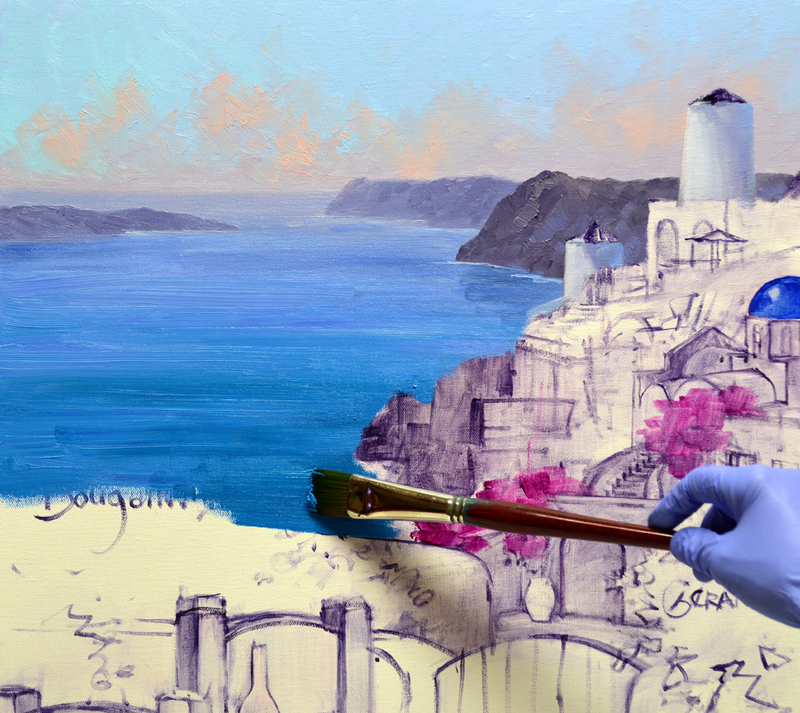 The basic plan is sketched on the canvas in a thin oil wash of MUD (Ultramarine Blue + Alizarin Crimon) + Liquin. I label the flowers so I don’t forget my original ideas as I paint. Don’t laugh, I’ve been known to do that! After painting the adobe structure I concentrate on the steps. There is a basic rule that helps…..The upright plane of the riser is always darker than the top, flat plane of the step tread. This holds true whether the stairs are in bright light or shadow. Bracing my wrist against a mahl stick steadies my hand as I delineate the fine details of the hardware on the red gate. I love blue ceramic flower pots. These are all painted with mixes of Ultramarine Blue + White. Following my usual sequence of Flowers First, Leaves Last the Sunflowers are blocked in. The mass of yellow is immediately transformed into these happy flowers when the dark centers are added. 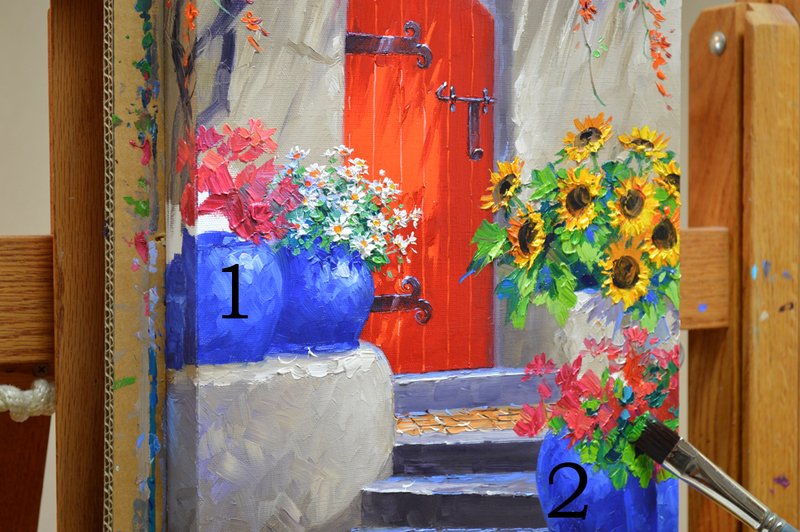 The Geraniums are painted in the same sequence. #1. 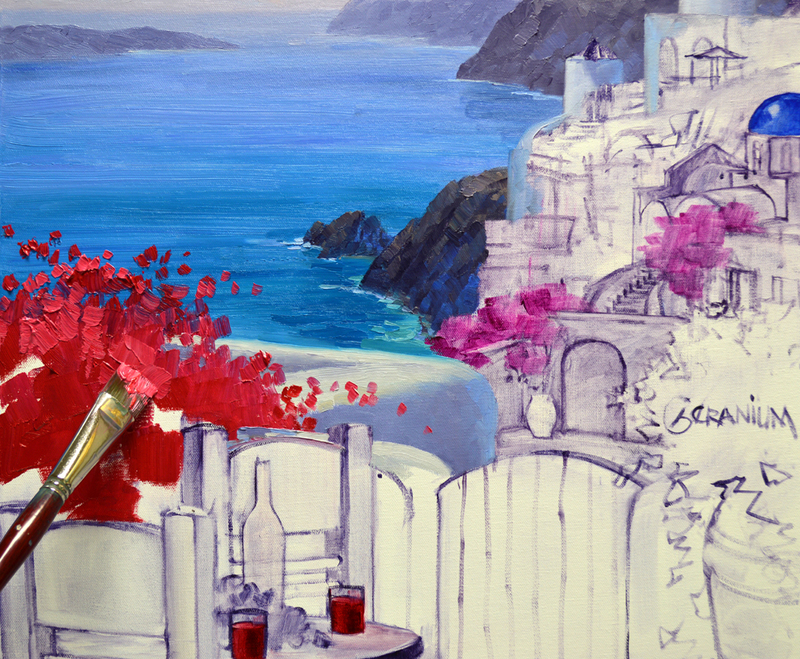 The color of the blossoms is blocked in with various combinations of Permanent Rose + White and Cadmium Red Light + White. #2. Adding the warm foliage with mixes of Pthalo Blue + Lemon Yellow. Sometimes you see an entrance to someone’s home that just takes your breath away. 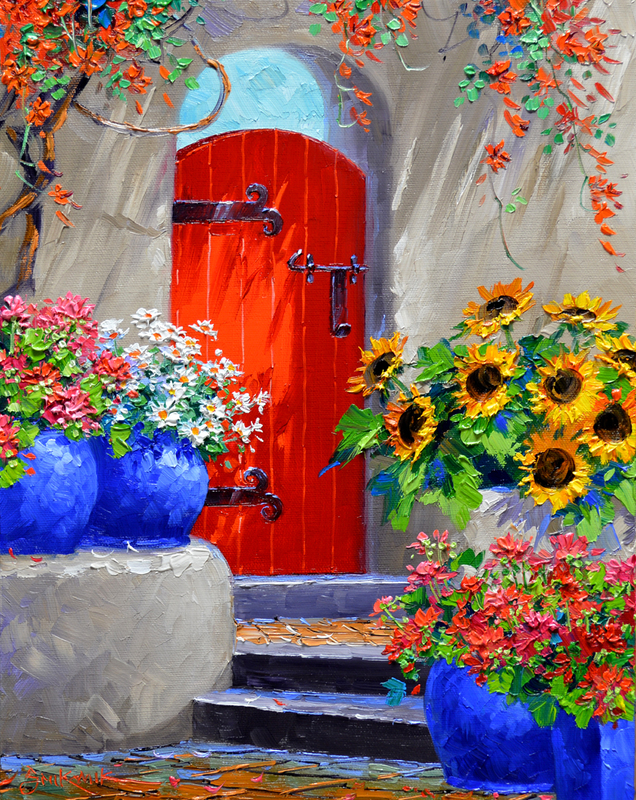 This is one of those, when I saw the red gate and blue ceramic containers I immediately knew it would be a super painting. Not having a camera I jotted down a quick sketch and made color notes. Wouldn’t you love to walk up to this gate when you come home? Here is your opportunity to envision just that every day. 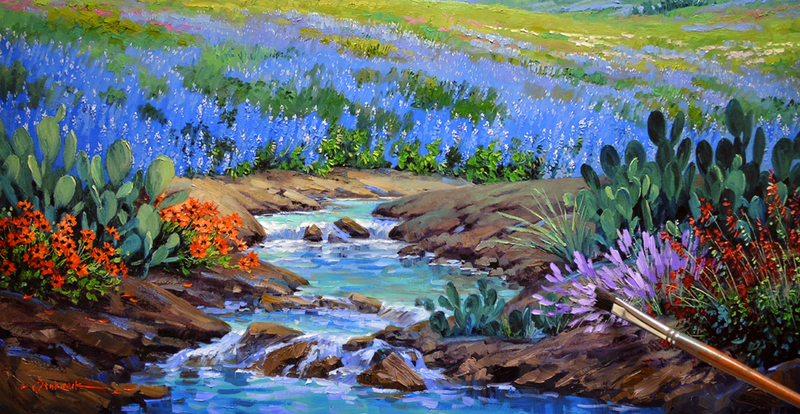 Give your wall A Flourish of Color with this Billboard of Happiness hanging in your home or office! You can click on the image to see it larger. A Flourish of Color measures 14 inches tall x 11 inches wide. This size Senkarik Original Oil Painting retails for $490 in our Team Galleries. But to make it more fun we are starting the bid at A PENNY! That’s right, ONLY ONE CENT! And don’t worry about framing, A Flourish of Color is painted around the edges on a gallery wrap canvas with 1 1/2 inch sides. 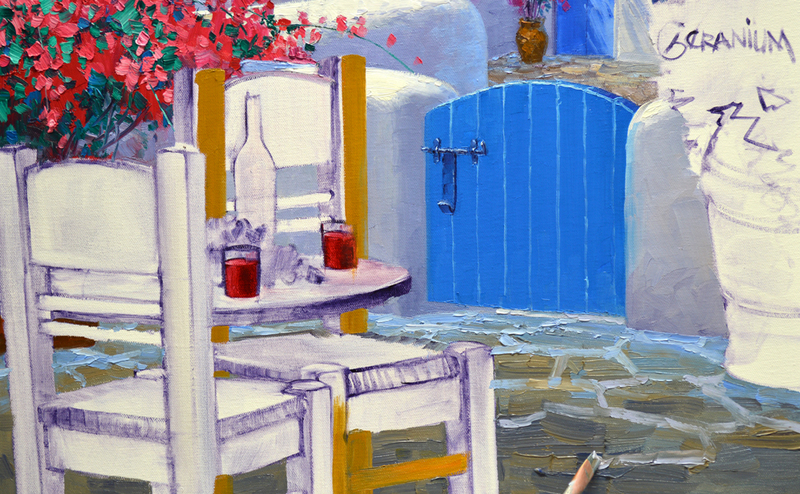 This painting is ready to hang as soon as you unpack it! We even provide the hanger and nail. A Flourish of Color would also make a wonderful gift for that special someone in your life who loves color! 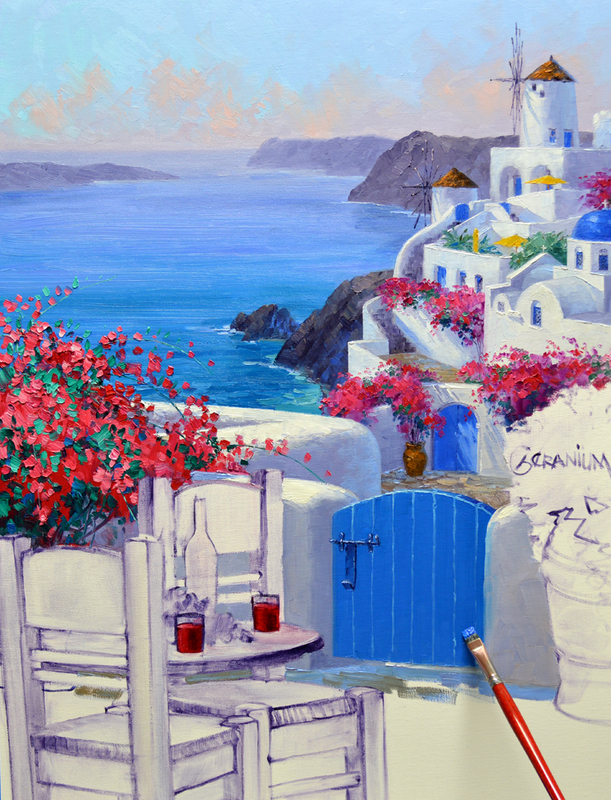 A Senkarik Original Oil Painting is a present that lasts for generations. HAPPY BIDDING! 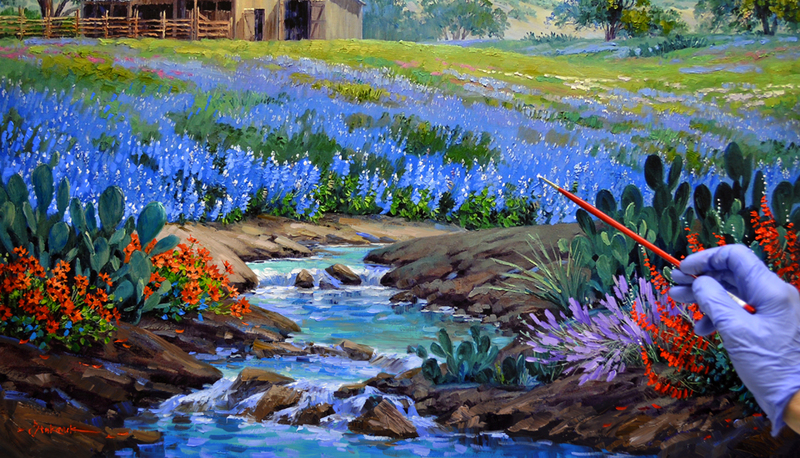 REMEMBER, the auction for A Flourish of Color ends Sunday, September 20 at 8 PM Texas (Central) Time.